This is the Seal of Atlantis, a symbol of the Covenant that changed the founders and granted the Knights access to their power. Once again HoangPhuc comes through in a big way and my thanks go out to him again. When I originally decided to contract him to do this piece I did so with the idea that I would have a patch made. Looking at it though, I realize that there’s a lot more I can do with it. I’ll keep you all informed on that side of it. Here is a quick excerpt from the book that shows the scene where the Seal of Atlantis first appears. At 11:30 the next morning Jaina and Aiden walked to the meeting area. They were alone so far and sat down on one of the benches. “We really should paint these tables again,” Jaina observed. Aiden’s thoughts moved a million miles a minute and he shut her out as he thought about what was to come, not really knowing what that was. He recognized it, the anticipation and fear of something unknown, he also knew that the fear of something was often times much worse than the realization. Jaina opened her mouth again, he knew that she was nervous as well and just trying to make small talk. He put his hand on her leg and gave her a small smile. She chuckled, recognizing her own nervousness and leaned into him, the anxiety in both of them dissipated. Aiden smiled to himself and wiped his sweaty hands on his pants. Noon approached the tables began to fill. For the most part, the people were silent and subdued; even the children were quiet. Jubal and Cali sat opposite them and they put Artorius and Ky onto the table so they could play. Aiden looked down at his watch, 11:59. His heart went into overdrive. Why was he so nervous again? He watched the time change from 11:59 to 12:00 and looked up to see if anything was happening. Anticipation swelled in the group. It was so quiet that when Aiden shifted on the bench everyone’s eyes snapped over to him. He smiled sheepishly and looked at his watch again. At 12:03 there was still no sign of the angel. Great. There’s going to be no living this down, Aiden thought. He stood up and everyone turned their eyes to him. Aiden cleared his throat and was about to say something when he felt a tear in the fabric of reality. A golden portal appeared in the middle of the four rows of tables and Ariel stepped through, radiant. For the first time, Aiden saw the angel clothed in his full glory. He exuded holy power and Aiden, against his own will, fell off the seat and landed prostrate. Aiden forced his head up, his innate stubbornness rising to the surface, and use his small ability to filter some of the light. Ariel glanced down and gave him one of his mocking smiles. A quick glance around the group showed everyone else on their faces. Angelic warriors held the babies of the mothers who had fallen. How sweet, he thought absently. Rips in reality begin to occur all around them and Aiden saw thousands and then tens of thousands of angels appear. They were also clothed in glory and it overwhelmed Aiden and his forehead hit the ground again. The waves of angelic glory beat against him and he dug his fingers into the earth. A second later it was over and Aiden lifted his head to see that the angels had covered their glory; he also saw that their numbers were in their hundreds of thousands. “Rise Atlanteans”. Ariel’s deep voice reverberated through the ground and Aiden climbed to his feet. The angels gaze swept over the assembly. “You are a chosen people. Anointed by Elohim,” he rumbled. When he finished sweeping his gaze over the people he looked directly at Aiden. “Come Aiden,” he said beckoning. Aiden marched to stand in front of him. “In my hand is a seal from On High”. He broke it open and unrolled the scroll and then began to read. As he broke the seal open Aiden’s heart skipped a beat and all the hair on his body rose to stand on end. Composed by the Most High and written by my hand Hasmal, a humble servant of his Holiness. In fulfillment of this Covenant you and your people are granted the deed to this land, from the eastern sea entrance into the Mediterranean to the western border on the Atlantic Ocean. This land in its entirety is given to you and your people, to be passed down through the generations until the end of the age. Furthermore; The Lordship of this land is granted to Aiden Locklear and its governance given into his hands. In my Name he and his people are anointed as shields for the weak and vessels of wrath to the wicked. Granted to him and his priests is the unrestricted access to My Spirit and the power therein, to be used in the war against the satanic principalities of this world, and against their mortal servants. This people will be granted the Blessing of Adam, to preserve the lost grace of humanity. A blessing held by faithfulness in this Covenant and held in the hands of the Emperor. Praise be to His name for ever and ever. Ariel rolled the parchment up and pushed its seal back into place. He handed it to Aiden and he reached out to take it with his right hand. It flashed and burned to ash to blow away in the slight breeze. Aiden cried out and looked at his singed palm, inscribed on it was an image. He stared at it. A mirrored tree, growing up and down, with interconnecting branches forming a circle. 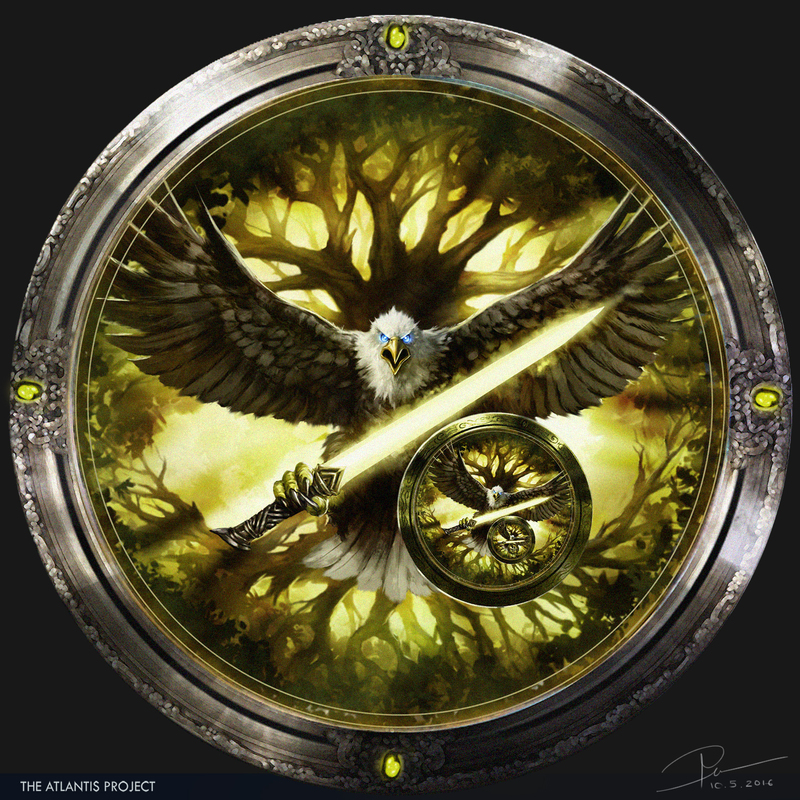 In the center was a great eagle with outspread wings, its pupils glowing in a piercing blue, and in one talon it held a Lightblade and in the other a shield with an intricate inlay of the Seal tree. “It is the Seal of Atlantis and a sign of this Covenant.” Ariel rumbled. He opened his large hand again and in it was a cylinder about nine inches long. He handed it to Aiden and again he reached out his hand to take it. It activated with a snap-hiss—a long, glowing metal blade sprang forth, and then hummed in his hand. He recognized it as the blade from his vision. The mirrored tree is a symbol of the balance of life, recognizing Aiden’s new role as a bringer of balance. The eagle is of course a symbol of strength, in this case a symbol of strength in the pursuance of a cause. The Lightblade held in the eagle’s talon is a continuation of this strength, the strength to be a vessel of wrath in the carrying out of balance. The shield is also a continuation of the strength that symbolized by the eagle, the strength to stand and protect those who cannot protect themselves. I hope that you enjoyed The Seal of Atlantis, if you haven’t already seen them you should check out the Lightplate Artwork, The Guardians of Atlantis, and The Map of Atlantis.